This ethereal-looking image of the Orion Nebula was captured using the Wide Field Imager on the MPG/ESO 2.2-metre telescope at the La Silla Observatory, Chile. This nebula is much more than just a pretty face, offering astronomers a close-up view of a massive star-forming region to help advance our understanding of stellar birth and evolution. The data used for this image were selected by Igor Chekalin (Russia), who participated in ESO’s Hidden Treasures 2010 astrophotography competition. Igor’s composition of the Orion Nebula was the seventh highest ranked entry in the competition, although another of Igor’s images was the eventual overall winner. 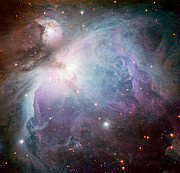 The Orion Nebula, also known as Messier 42, is one of the most easily recognisable and best-studied celestial objects. It is a huge complex of gas and dust where massive stars are forming and is the closest such region to the Earth. The glowing gas is so bright that it can be seen with the unaided eye and is a fascinating sight through a telescope. 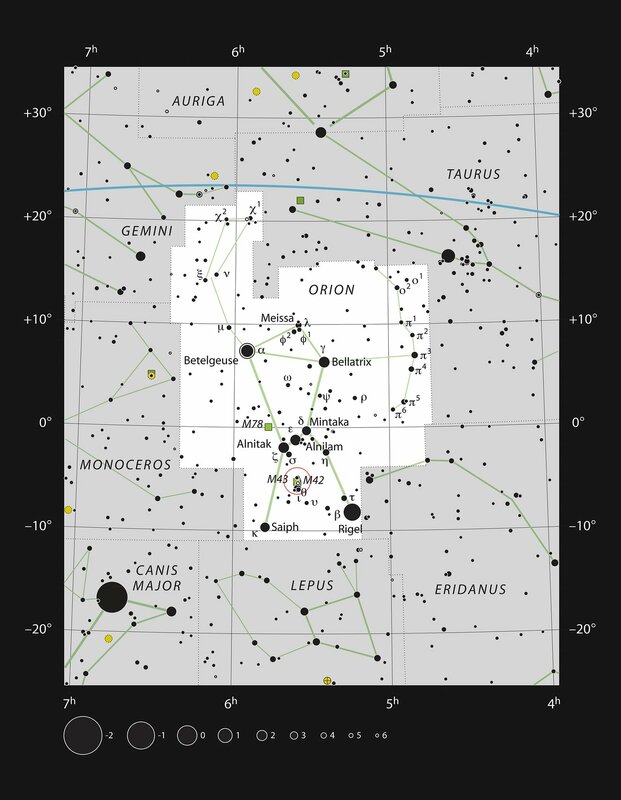 Despite its familiarity and closeness there is still much to learn about this stellar nursery. It was only in 2007, for instance, that the nebula was shown to be closer to us than previously thought: 1350 light-years, rather than about 1500 light-years. Astronomers have used the Wide Field Imager on the MPG/ESO 2.2-metre telescope at ESO’s La Silla Observatory in Chile to observe the stars within Messier 42. They found that the faint red dwarfs in the star cluster associated with the glowing gas radiate much more light than had previously been thought, giving us further insights into this famous object and the stars that it hosts. The data collected for this science project, with no original intention to make a colour image, have now been reused to create the richly detailed picture of Messier 42 shown here. The image is a composite of several exposures taken through a total of five different filters. Light that passed through a red filter as well as light from a filter that shows the glowing hydrogen gas, were coloured red. Light in the yellow–green part of the spectrum is coloured green, blue light is coloured blue and light that passed through an ultraviolet filter has been coloured purple. The exposure times were about 52 minutes through each filter. This image was processed by ESO using the observational data found by Igor Chekalin (Russia) , who participated in ESO’s Hidden Treasures 2010 astrophotography competition , organised by ESO in October–November 2010, for everyone who enjoys making beautiful images of the night sky using real astronomical data. Igor searched through ESO’s archive and identified datasets that he used to compose his image of Messier 42, which was the seventh highest ranked entry in the competition, out of almost 100 entries. His original work can be seen here. Igor Chekalin was awarded the first prize of the competition for his composition of Messier 78, and he also submitted an image of NGC3169, NGC3166 and SN 2003cg, which was ranked second highest. ESO’s Hidden Treasures 2010 competition gave amateur astronomers the opportunity to search through ESO’s vast archives of astronomical data, hoping to find a well-hidden gem that needed polishing by the entrants. Participants submitted nearly 100 entries and ten skilled people were awarded some extremely attractive prizes, including an all expenses paid trip for the overall winner to ESO's Very Large Telescope (VLT) on Cerro Paranal, in Chile, the world’s most advanced optical telescope. The ten winners submitted a total of 20 images that were ranked as the highest entries in the competition out of the near 100 images.